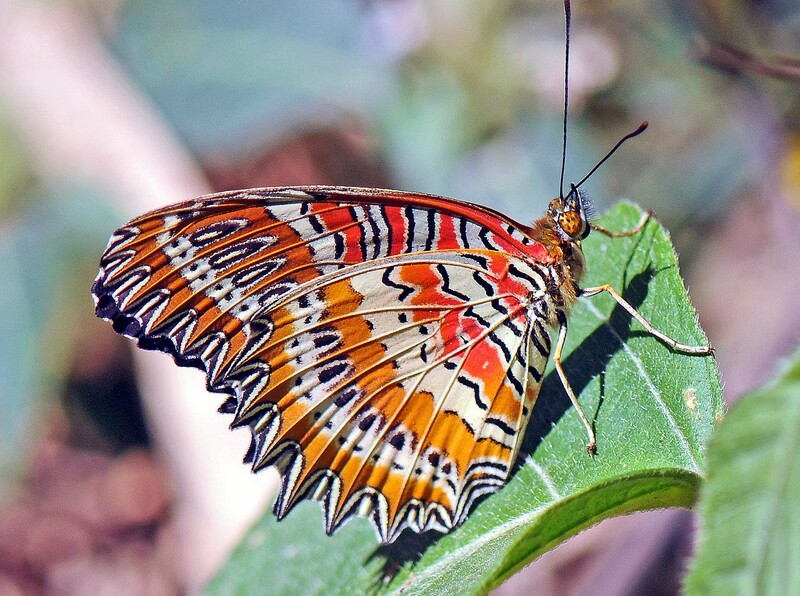 I wrote about this beautiful butterfly – The Red Lacewing – in a previous blog (‘Don’t eat me I’m poisonous!) posted on this site last year (12 Jan 2014). I am including a little history here. This species was first named by a British entomologist called Dru Drury (1725-1803). Drury was a fascinating character; a wealthy silversmith who built up a huge collection of over 11,000 insect specimens (1). Whilst he remained safely in London, he paid travellers to obtain exotic specimens for him (2), although it seems he borowed this species from a fellow Londoner (see below)! Drury is perhaps best remembered for publishing a three-volume work entitled: Illustrations of Natural History. This seminal work was later revised and republished under the title: Illustrations of Exotic Entomology, in 1837. Both publications are available online at the Biodiversity Heritage Library (3). Drury must have been proud of his work, as he sent the 3-volume set to Linnaeus, in 1770, referring to him (Linnaeus) as the father of natural history (4). It was a generous gift. The volumes are now extremely valuable: Christie’s were offering a set for £5,000 (4). 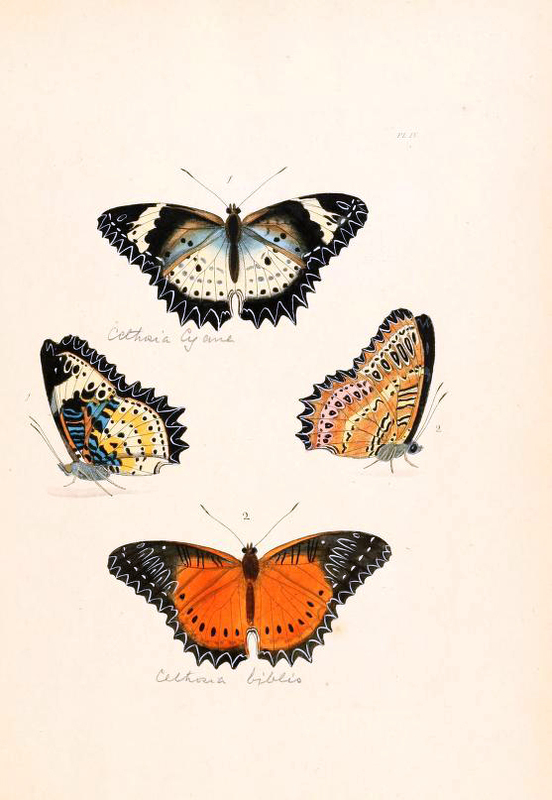 The Red Lacewing was illustrated in Figure 2, on Plate 4 of Drury (Illust. Nat. Hist. Exot. insects Vol 1) (shown below). The description of the colours and patterns of the insect on page 9 are remarkably detailed, but there is nothing – not surprisingly perhaps – on the biology of the insects. He concludes the description with the following: “It was brought from China, and was very obligingly lent to me by Mr. Lee of Deptford, to take a drawing from.” So the origin suggests that the specimen may have been the subspecies Cethosia biblis biblis. Drury finishes by stating: “I cannot find it described in any author”. He was the first person to describe it for science. The illustrator of these works seem to get scant recognition! There is a signature at the bottom of the original plate, by Mss Harris Del et Sculp [one Moses Harris (1730 – c. 1788) who invented the colour wheel!]. Drury himself refers – on the title page – to the fact that his volumes contain “Upwards of 240 figures of exotic insects, according to their different genera, very few of which have hitherto been figured by any author, being engraved and coloured from nature, with the greatest accuracy, and under the author’s own inspection”. Perhaps there is a mention of the artist somewhere in the volumes; I have not searched them all, but a more generous patron might have mentioned the illustrator on the title page! Next Next post: A bunch of pansies!